Are you ready for a weekend get-away, then come chose a Classic a-frame and start planning your next camping trip! 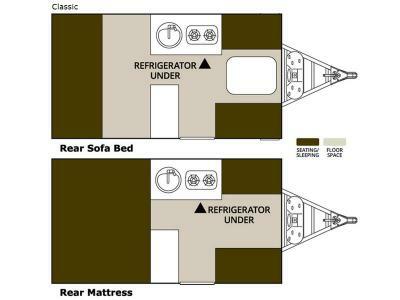 Along the rear you can choose to have a sofa bed or a mattress. In the kitchen area you will find a 3.0 cu. ft. refrigerator where you can store your perishables, a two burner range, and a sink where you can wash dishes. After you are done playing and exploring outside then come clean up at the outside shower. 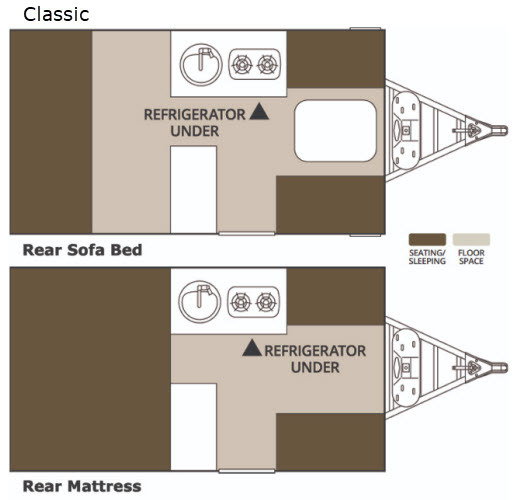 For any camping trip you will want an ALiner Classic. There is a fiberglass exterior and four stabilizer jacks. You can load up any tools, camping chairs, or other gear in the two baggage doors. 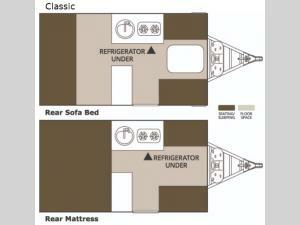 Throughout the interior you will find LED lights, 4" high density cushions with piping, and a Fantastic fan. Come see just how fun camping can be with a Classic a-frame!